We expanded and moved into the old Privateer Brewery on Temperance Street in October 2015, and the first thing we did was build a bar to have monthly brew taps. These went well and in May 2016, when joint tenants Cave Direct moved out, we expanded through to the North Western half of the arch, built a new bar with more space and seating, and in September we started opening this bar weekly. We’re just ten minutes’ walk from Piccadilly Station, with Alphabet Brewery and their weekly tap and Grub food fair half way between us. The weekly brewery taps are steadily growing in footfall with between 40 and 70 people through the doors on Saturdays, although Friday evenings are still very, very quiet. 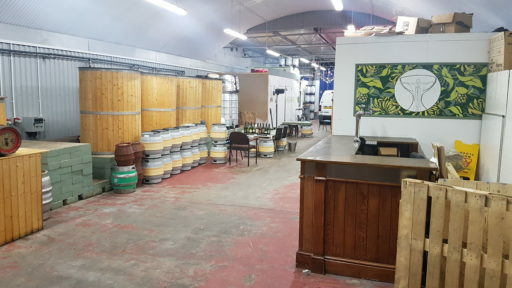 We’ve realised that the Temperance St bar is now completely unused except for hiding crap out of the way, and we’re also very aware that Manchester itself is hard for breweries to get their beers into, despite the large amount of pubs and bars. So, we’re offering our second bar, free of charge, to any small(ish) brewery so they can have their own pop-up brew tap. Why would we do this? It’s not entirely altruistic: we’re hoping that with the joint promotion these events will have, we’ll encourage more folk to make the extra five-minute walk across the Mancunian Way and visit our brewery tap, and hopefully come back at a later date. What could you get out of this? Cash flow and exposure. You’ll be selling your own beer over the bar, taking the money for it, and you’ll be selling it to Mancunian drinkers, who’ll talk about it on social media and hopefully also go back to their locals and tell them what good beer they’ve been drinking. To start with, we’re offering the bar on the first and third weekends of the month, until we work out how it works with the other things that we organise at the tap. These are the dates we’re doing it, and who’s already confirmed a date.